MONROE, NH – When Rocky Bunnell got out of the Air Force in 1973 he considered different careers, but his father Bill Bunnell was trucking wood and he decided to first help him out. As is often the case in the woods business, one thing led to another, and it wasn’t long before he bought his own truck. “Next thing you knew I had crews cutting wood and I was trucking it just like he did, and then later on I got right out of the trucking and I went strictly to the woods,” Rocky recalled recently as he looked back over the four-plus decades that have taken him from that small start to owning his own Master Logger certified logging operation and being honored by the American Loggers Council (ALC) for his efforts on behalf of loggers in Washington D.C.
Rocky grew up on a farm in Vermont logging with his family using horses. In the late 1960s his father got into buying, selling and trucking wood and moved across the Connecticut River to Monroe, New Hampshire. Rocky started out doing the same in Monroe, but over the years he ramped up; first adding subcontractors with cable skidders, then buying his own slasher, then his first skidder. Eventually he reached the point where all the equipment and the workers on his jobs were part of Rocky Bunnell Logging. Today Rocky has four men working for him and a full-time whole tree logging operation. His company operates two John Deere grapple skidders and an older 518 Cat skidder – the first he bought, a Tigercat feller buncher, a mobile Hood slasher/loader, a pull-through delimber hooked to the slasher, a Tigercat 220 log loader on a Mack truck, and a Western Star tractor trailer. He now shares a garage and office with his oldest son, who operates an even larger independent logging firm. Over the years Rocky became involved in organizations including the New Hampshire Timber Harvest Council, largely due to a friendship with veteran New Hampshire logger Dan Keniston who was already involved. This led Rocky to involvement with the ALC, where he is now a board member and well-known for speaking plainly on behalf of loggers in Washington D.C. This fall Rocky was honored by the ALC with the President’s Award for his leadership and service promoting more participation in the ALC’s Spring Washington, D.C. Fly-In, where loggers meet with elected officials to advocate for the industry. There are certainly plenty of loggers in trouble right now given the state of wood markets, especially for low value wood fiber. A great, professional crew like the one he employs is key to staying in business, Rocky says. Rocky still enjoys being on the job with the crew in his favorite piece of equipment, the Tigercat 220 loader, loading trucks. It’s where you will find him in the busy winter season. Rocky became a Master Logger after learning of the program through Verso Paper, and the quality of work and respect for the forest Master Logger stands for serves his company well. 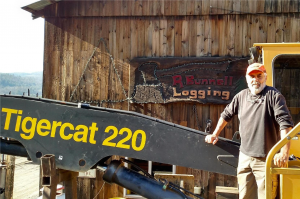 Over the years logging has become more than just cutting wood for the avid outdoorsman, who believes strongly in what it does for the forest and the wildlife. Proud to call Rocky a friend. The work he does for our industry is immeasurable !